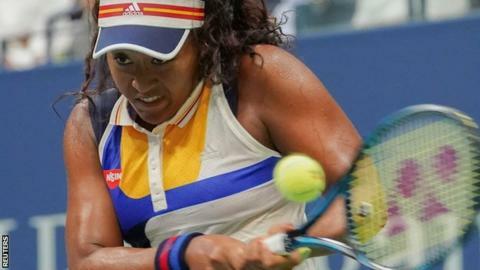 Defending champion Angelique Kerber was knocked out in round one of the US Open by Japanese teenager Naomi Osaka. The German sixth seed was overpowered by the 19-year-old world number 45, who won 6-3 6-1 under the roof in Arthur Ashe Stadium at Flushing Meadows. It continues a disappointing year for 29-year-old Kerber, who has not won a title since her victory in New York 12 months ago. "I'm still the same player and the same person," she said. "I know that I will not be giving up like this. So for me, I will try to forget the match as soon as possible and look forward again." Two-time Grand Slam champion Kerber struggled badly with her second serve, winning only 37% of points behind it. Osaka hit 22 winners to Kerber's nine, while the German also made 23 unforced errors in an erratic display. "She just goes for it," said Kerber. "I think she took the chances and she played a very good match. But for me it was for sure not the best day and not the best match." Osaka, who led Madison Keys 5-1 in the final set in round three of last year's US Open before losing, said: "It means a lot, especially since last time I was here. "This court has not given me fond memories but hopefully this overtakes that. "When it was 4-1 today I was thinking, 'I really hope I don't do what I did last year' and that let me focus a lot."